One man wrecking crew Jo Capitalicide continues his path with the recently renamed Ice War. Not sure if the band is more than one man staffed these days, beyond its main character, but after a series of singles and preliminary EP last year, the eponymous full-length debut is finally out. 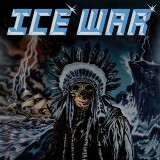 In short 30+ minutes Ice War does a take on metal both very archaic and yet extremely refreshing. Deconstructing everything to pure basics, Ice War is something along the lines of more streamlined, less quirky early Slough Feg, with melodies as basic as Accept from I’m a Rebel, yet altogether it is all its own independent creation. The production on the album is so simple and without frills, you would think you can do music like that as well. Especially given that Jo Capitalicide vocals are nothing but echoing shouts, the man is not being shy about sounding unrefined. Guitars are, on the opposite, totally lack any reverb, so you can hear a few notes that Ice War sequences pretty clearly. And calling Ice War an album of a few notes is something I have to do, yet the album is so unbelievably catchy, despite the parts repeating themselves, or maybe Ice War has this effect on you because it is so repetitive. I challenge you to come up with the riffs on the surface so uncomplicated, yet so addictive. The galloped verses will make your feet tap (Battle Zone, Dream Spirit), and the hooks in the choruses (I am the Prisoner, Reverence of Gold) are unbelievable and increase their sinking in the flesh power as the album continues. Fast whirling folky chardash (Standing Rock), epic anthem in the vein of Brocas Helm (I am the Prisoner), a bit softer tune (Reverence of Gold), not as straight rhythmically We Will Stand, or a final speed metal blast Falling Out, I don’t quite remember an album where just about every song sounded awesome. There is absolutely zero fat in Ice War, so as soon as the album is over, you want to put it on constant replay, and that is what I have indulged in for the last week or so.